Sun-baked Andalusia is a tourist favorite in which Moorish and Christian Spain show off their cultural strengths against a backdrop of flamenco, tapas, matadors and bullfights. While those who have only known the south of Spain through books might think of Andalusia as a hot, dry plain, Andalusia has the Iberian peninsula's highest mountains and nearly 15 percent of its terrain is 3,300 feet above sea level. Andalusia has many unique ecosystems; nearly 20 percent of Andalusia soil lies in a protected area. Andalusia's relatively mild winter and spring climate attracts lots of visitors from colder climates and is a good place to start your vacation from if you arrive in Europe in Early spring. It's dry and hot in the summer; you may wish to examine the historic climate charts for Seville if you're planning a vacation in the region. Andalusia is the region that most people think of when they think of Spain. Granada, Cordoba, and Seville are the cities making up its "golden triangle," but there are other, smaller places within Andalusia to discover as you'll see below. 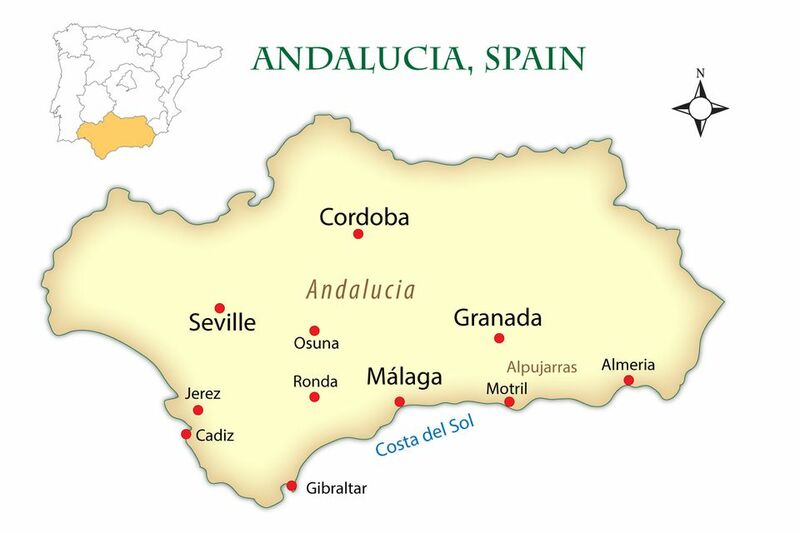 Andalusia is very compact, considering the number of tourist destinations it contains. A vacation here doesn't mean long train trips or lots of driving. Remember that it's hot in the summer. You'll want to do everything late at night when the temperature lowers, but then in Spain, you can. Seville - The capital of Andalusia and the best place to witness Semana Santa, the week before Easter, get lost in the Barrio Santa Cruz, have some tapas and watch a flamenco show. Seville's subtropical Mediterranean climate offers dry summers and wet winters; it shares with Cordoba the dubious honor of suffering the hottest summers in Continental Europe. Cordoba - The least visited of the Andalusia big three—don't miss the old mosque: the Mezquita de Cordoba, today a World Heritage site. Folks say Cordoba was the biggest city in the world during Islamic rule in the 10th century. After the Reconquista, Cordoba returned to Christian rule (1236). Heat lovers rejoice: During July and August, the average high temperatures hover around 99 degrees Fahrenheit. Granada - Visit the Moorish palace-citadel everyone knows, The Alhambra, wander the narrow lanes that shake through El Albayzín, the district reflecting the cities medieval Moorish past. and visit the Generalife, a 13th-century leisure palace with gardens built on the slopes of the Hill of the Sun. Cádiz - An evocative city center worth a visit. Check out the big Carnival in February. Go for two or three days, unless the beach mesmerizes you. Gibraltar - Worth a day for a visit with our ancestors, but just. Bring your Pounds, Sterling, it's British. Malaga - Hanging out with the jet set on the Costa del Sol was once the focus of this city, but there are many newly opened art galleries here and foodies are flocking to Málaga’s new gastro market, Mercado Merced is in the heart of the Andalusian city. Motril - Stay in a cute place on the beach while visiting the likes of Alpujarras, a string of mountain villages worth visiting. Jerez - Jerez is the capital of Andalucian horse culture, sherry culture, and is, some say, the cradle of Spanish flamenco. Ronda - Bullfights, a deep ravine, and an Islamic old town awaits your visit. Damian Corrigan has outlined a Suggested Itinerary for Andalusia that includes Seville, Cadiz, Ronda, Malaga, Granada and Cordoba. What Regions in Spain and Portugal Have the Best Wine?